We believe we are called to be the light of the worLd, to speak, connect, serve, support, work for justice and equality for all and to change lives. Crystal Lake Food Pantry: FCC was a founding member of the Crystal Lake in 1982 and has been actively involved in regular volunteering and financial support. At least monthly members assist in stocking food and volunteering at the food pantry. Contact the church office for our next volunteer day! Disaster Relief: FCC has been actively involved in local disaster relief. From financial assistance to filling sandbags to volunteering at relief centers we do what we can to help out our neighbor when disaster strikes. Recent efforts have gone to help flooding victims in Northern Illinois, Tornado victims in Ottawa,IL and Washington, IL. Contact the church office for more information. Annual Adult Work Tour to help build and repair homes in the Appalachia Mountains. Contact the church office for more information. Re-Member: For over 10 years FCC visited and supported the Pine Ridge Indian Reservation in South Dakota as they improve the quality of reservation life through relationships, shared resources and volunteer services. Youth Work Tour: Every year Pilgrim Fellowship (high school youth) travel to help build and repair homes for those in need. 2017- Joplin, MO to rebuild after tornadoes, 2016. 2016- Savannah, GA. Contact Pastor Emily Davis for more information. 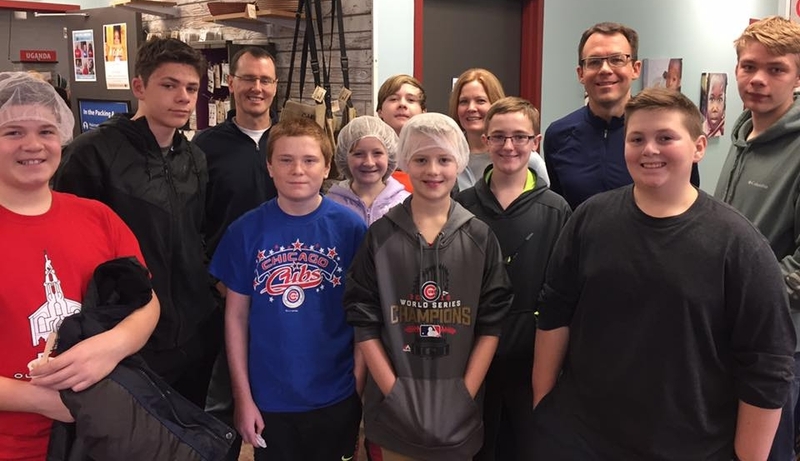 Feed My Starving Children: Several times a year we volunteer to pack thousands of meals to be sent to malnourished children throughout the world. Contact the church office for our next volunteer date! One Great Hour of Sharing: Every Spring we take a special OGHS offering to support disaster, refugee, and development activities throughout the world.